Home » » No More Bhopal, Chernobyl & Fukushima! No More Bhopal, Chernobyl & Fukushima! No More Bhopal! No More Chernobyl! No More Fukushima! 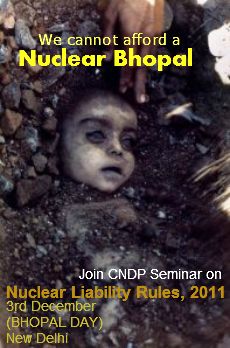 On the Occasion of 27th Anniversary of Bhopal Gas Tragedy Coalition for Nuclear Disarmament (CNDP) cordially invites you for a panel discussion on Nuclear Safety Regulatory Authority Bill, 2011 & Civil Liability for the Nuclear Damage Rules, 2011 Which the Union Government is bent upon pushing during the current winter session of the parliament in total disregard to the lessons of the biggest industrial disaster of the last century.